Plastic or Wooden, which play kitchen should I buy? How old is the kid you are buying it for? Making a choice between plastic or wooden toy kitchens can turn difficult for many parents. This should not be so. The 2 types of play kitchen have their advantages and disadvantages. Know this is the main factor that will help you make your decision fast. Another factor is to take into account you and your child’s needs. This can also help you decide quickly. You should know that both plastic and wooden play kitchens do contain other materials. Stainless steel units are common with children’s kitchens. They’re only classified as wooden and plastic because those are the two primary materials. What are the pros and cons of plastic and wooden kitchens? A wooden kitchen is a weighty object. It is not to be moved around constantly. The best thing is to find a permanent spot for it in the home. On the other hand, plastic kitchens are usually lightweight. They can be moved around in the home as the need arises. Is yours a family that is constantly on the move? Consider buying a plastic play kitchen. And if there is a possibility that your kid will need to play with the kitchen anywhere in the house for example, when other families are visiting, you should also consider a plastic play set. Wooden kitchens usually last longer than plastic kitchens. They can be passed on from one sibling to the other. Plastic kitchens don’t have the sturdiness of wooden kitchens. 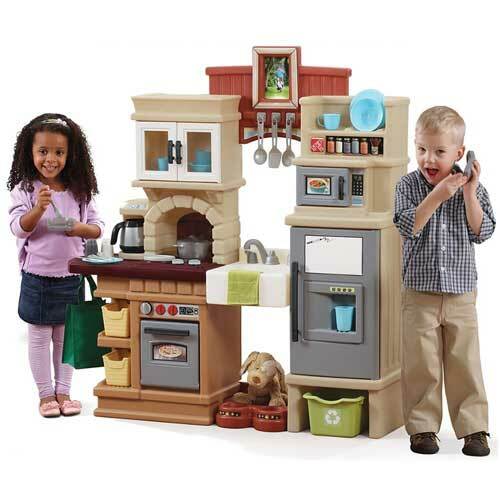 For safety reasons, play kitchen sets are recommended for 2-year old and above. Many toy cooking sets come with small parts and accessories that can pose a health hazard to little ones. 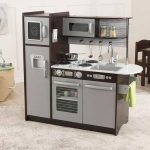 Since kids can use toy kitchens deep into their teens, taking into consideration the age of your child can help determine the type of toy kitchen you will buy.